A few days ago, in a blog entry on the relationship between psychedelic and progressive rock, I discussed The Nice, the British band from which emerged Keith Emerson, later of Emerson, Lake & Palmer (ELP). It has happened since the writing of that blog—primarily because I’ve been preoccupied by certain theoretical issues that emerged as a consequence of writing it—that I have made an effort to re-familiarize myself with the music of ELP, trying to get a better handle on what so-called progressive rock was (is) all about, at least in its ELP incarnation. It has been years since I listened seriously to ELP’s music, having given up on them long ago after the release of the appropriately titled 3-LP set, WELCOME BACK MY FRIENDS TO THE SHOW THAT NEVER ENDS… LADIES AND GENTLEMEN, EMERSON, LAKE & PALMER (1974)—and they weren’t kidding. I can’t recall ever playing sides 5 and 6 of that ponderous set of records—still haven’t—although I’ve had the album now almost 35 years, frayed corners, ring wear, bulk and all. Like an old high school classmate, it’s an artifact of a time long gone, one with whom you have instant familiarity, but little communication. But having done some reading of critical assessments as well as a bit of checking on fan sites during the past several days, I’ve learned that the general consensus is that BRAIN SALAD SURGERY (1973), with its famous H. R. Giger cover, is the band’s finest album. I do not agree: after having given a focused listen to every album up until (but not including) WELCOME BACK MY FRIENDS… the past couple of days, I doubt seriously I’ll ever return to blarney such as “Karn Evil 9,” a huge chunk of BRAIN SALAD SURGERY. However, having re-familiarized myself with the band’s first few albums, I think the best album is TRILOGY (1972), which has the best song written by Emerson and Lake, “From the Beginning.” But that’s neither here nor there. I found myself returning to the band’s third album, PICTURES AT AN EXHIBITION (1971 UK; 1972 USA), since it seems to me to epitomize everything the band was about—the objective correlative of Emerson, Lake & Palmer, as it were. I picked up a copy of the remastered CD (Shout! Factory, 2007) of the album in order to put it on my iPod, and while I was at the store I also found and purchased a used (“previously owned”) DVD by ELP that I didn’t know about but also happened to be titled PICTURES AT AN EXHIBITION (Classic Pictures Entertainment, 2002). Mistakenly, I assumed the live performance on the DVD was the same performance as on the CD—not so. The performance on the CD (38:07) was recorded at Newcastle City Hall on March 26, 1971, while the one on the DVD (41m 50s—not the complete concert) took place a few months earlier, recorded at the Lyceum Theatre (London), on December 9, 1970. The DVD reveals why Keith Emerson, busily tickling the ivories (and fondling the knobs of his then avant-garde modular synthesizer) in his tight fitting, glittery pants and vest, must be considered the Liberace of rock. 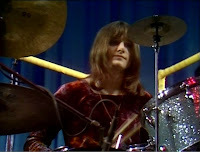 I was pleasantly astonished, however, by the sheer youthful exuberance of drummer Carl Palmer: at the time the concert was recorded, he was a mere twenty-one years old, but he looks about fifteen or sixteen years old in the film. Little did he know about what lay ahead, in the form of rock stardom. Having watched the DVD of PICTURES AT AN EXHIBITION twice now, and having walked many, many miles the past few days listening to the album on my iPod, I’ve concluded that Emerson, Lake & Palmer (and progressive bands like them, such as King Crimson, from which Greg Lake emerged) represent, in a rock context, the fundamental values of modernism: complexity, individuality (as exemplified by the naming of the band eponymously), virtuosity, and mastery. 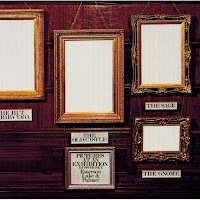 It is no accident that ELP, like all popular musicians in the modernist tradition since Louis Armstrong (the jazz trumpeter who enabled the transformation of the popular musician into artist) released albums with titles arguing for their status as artists: WORKS: VOLUME 1 (1977) and WORKS: VOLUME 2 (1977). Meaning, if you didn’t become a muso, well, you became something else. Emerson, Lake & Palmer still perform, of course (although not necessarily together as a band), but I think the band now invokes a set of values—modernist values—that have long since been replaced by the values of post-modernism. But post-modern values shall become the subject of a subsequent blog.